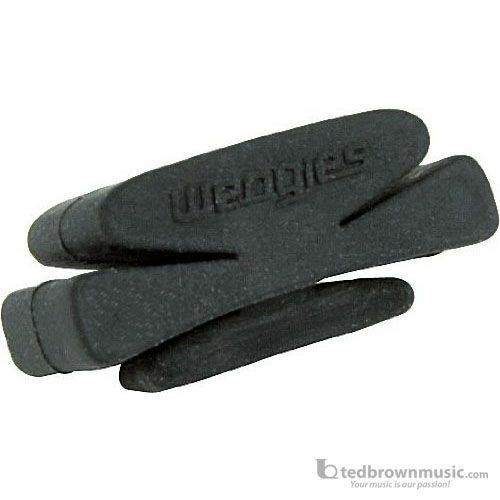 The Wedgie Guitar Pick Holder is a must have accessory for any guitarist. This flexible pick holder uses a patented twist-lock design to mount on the strings of any guitar just above the neck. Place the holder between the strings and rotate it 90 degrees, picks are then held in either of the 2 wedge shaped slots. Wedgies use no adhesives and will not damage your guitar in any way. Since the holder is suspended in the strings, Wedgies will not affect tuning or tone. No more stick-ons or weaving your pick in the strings, just put a Wedgie on your guitar and stop losing picks.